Carebear apologists express a great deal of insincere concern for "newbros". They say we must nerf ganking to protect new players. And if those nerfs just so happen to also benefit the older carebears--oh well, not their intention! But in truth, ganking isn't bad for new players. 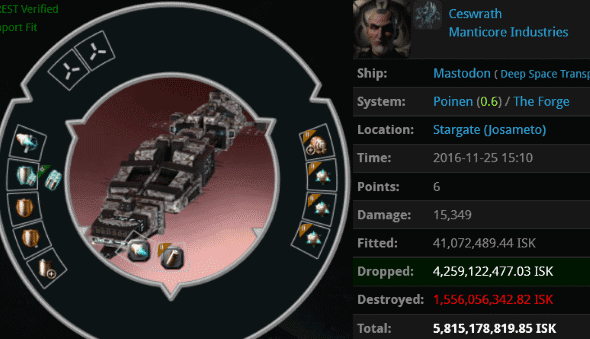 If a carebear spends too much time in EVE before his first loss, the pain is more severe, not less. viperme lost a fail-fit Hulk. 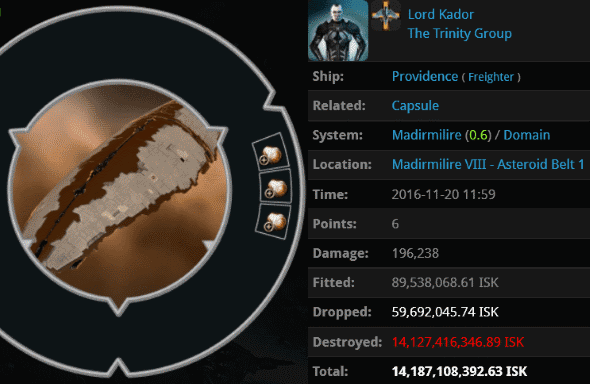 This pitiable ship was the first loss on viperme's zKillboard record. viperme has been playing EVE for nine and a half years. Agent Lawrence Lawton reminded the grizzled veteran of his responsibilities under the Code. 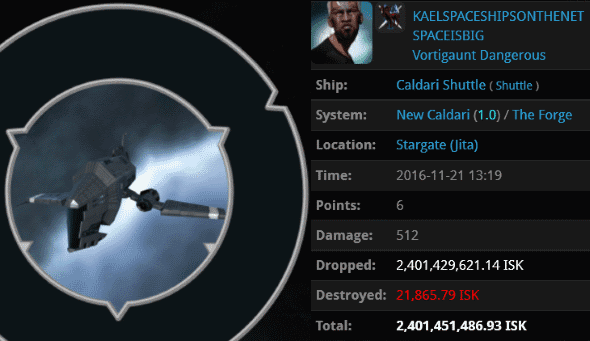 According to the carebears, someone who's been playing EVE for nearly a decade should be in the proper frame of mind to be ganked. And yet, the tears did flow. Agent Lawrence treated the miner like any other. viperme didn't seem to be any more mature than the ones who have been playing only a few days before their first loss. Just shy of 10 years into the game, viperme still didn't understand the emergent gameplay competitive non-consensual elite PvP sandbox that is EVE. It was as if miners need someone to teach them, or else they'll never get it. No one had ever reached out to viperme before. Agent Lawrence Lawton was willing. He introduced the miner to the game. 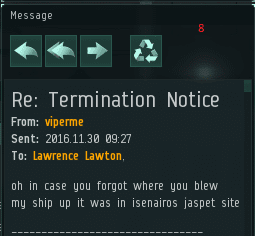 It was then that Lawrence realized that viperme was unusually salty, even for a highsec miner. Could it be that going an extended period of time without being ganked makes things worse for a carebear? Our Agent had no choice but to classify viperme as a "problem" miner. There can be little doubt that viperme would be happier and healthier in every respect today, had someone done him the favor of ganking him back in 2007. Agent Lawrence confirmed that the miner suffered from elevated levels of salt, a condition marked by sending multiple tearmails without waiting for a reply. viperme felt his EVE experience had been ruined. He'd only managed to go nine and a half years without losing a ship. What a tragedy. He probably won't make it to the year 2026 without losing another one. How can a carebear enjoy a game when he's constantly having to watch his back? 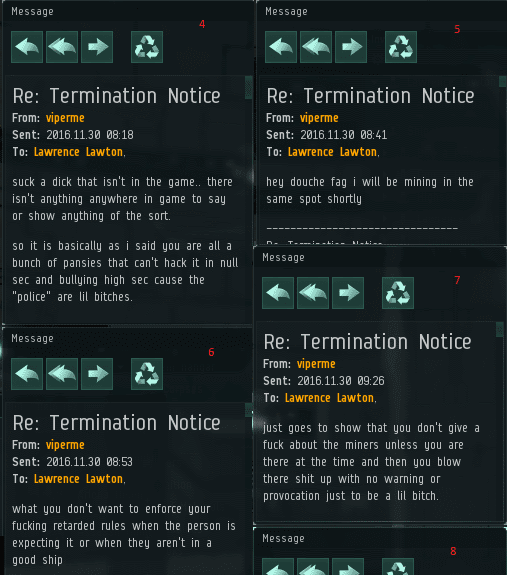 Additional tearmails from viperme began to clutter Lawrence's inbox. Another theory: Miners naturally accumulate reserves of salt which grow until finally released via gank. After sending a dozen tearmails, viperme finally went quiet. Did he calm down, or did he simply exhaust himself? 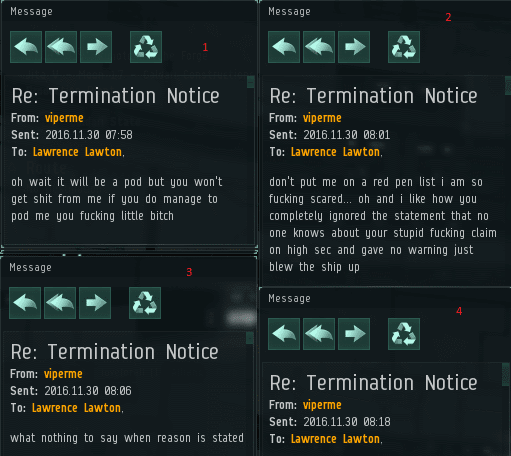 To find out, we must wait and see if Agent Lawrence Lawton receives his 30 million isk Red Pen fee. Previously, on MinerBumping... Agent Liek DarZ brought the Code to the miners of Osmon. He soon learned that they were in desperate need of his calming influence. Agent Liek observed that the miners had peculiar ideas about PvP. Namely, they were against it. This is a strange attitude to have. It would be like signing up to play EVE Online even though you hate spaceships. But it was worse than that--the miners lacked civility. To the carebears of Osmon, ganking someone is as impolite as sending them a real-life death threat. No wonder they petition ganks. Our Agent was confident that he could bring the miners to their senses, if only they would calm down. As a trained Agent of the New Order, Liek knew to instruct the miners to calm down. The tricky part is, when miners aren't calm, they don't follow instructions very well. Seeing the Osmon mining community in such a sorry state, Liek DarZ relied entirely upon his faith in the Code. The Code guarantees ultimate victory in highsec. Every Agent knows that no matter how much opposition they face, they will be rewarded if only they continue to press onward. Agent Liek encountered Hannah Galvinov illegally mining in a fail-fit Retriever. He stopped her criminal enterprise dead in its tracks. But could he start her rehabilitation? Hannah didn't seem like a prime candidate for a mining permit. She denied the legitimacy of the New Order. Hannah also lacked a basic knowledge of the Code. How can one follow a Code if one doesn't know it? Our Agent stepped in to help her, effectively acting as Hannah's private tutor. A breakthrough: Hannah began to calm down. And once she started calming down, her desire to become calm only grew. ...And calm miners buy permits. Agent Liek DarZ experienced the victory of the Code in Osmon. Miners saw wisdom in compliance. It doesn't hurt that Liek is a likeable fellow--a quality possessed by all our Agents. You know what's interesting? When miners buy permits and obey the Code, they start to become likeable, too. 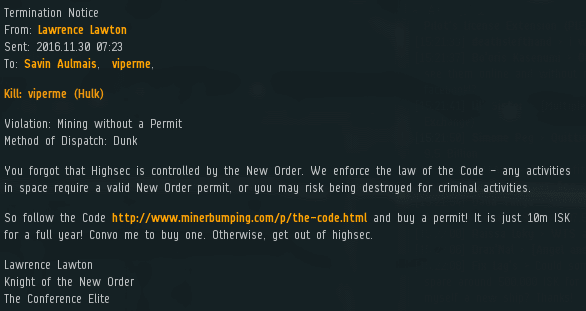 Previously, on MinerBumping... Osmon miner gslayer bought a permit but soon found himself on the receiving end of a gank from Liek DarZ, the very Agent who'd sold him the permit. Liek patiently lectured gslayer about the miner's Code violations. Though gslayer was satisfied by the explanation and bought another permit, the residents of Osmon showed signs of not understanding the Code. Highsec carebears usually have trouble absorbing the Code's lessons--even though they're crystal clear. Most likely the carebears' confusion represents a lack of willingness to understand, rather than a lack of ability. They don't want to accept the implications of having rules to follow. And yet, the benefits of the Code are so obvious that only a hardened Anti-Ganker can miss them. Some carebears seek comfort in an attitude of ambiguity. Dave Maulerant couldn't believe that people would subscribe to EVE simply to build a civilization and enjoy creating emergent content. From his perspective, the only good reason to spend a PLEX on EVE is to be able to grind isk to buy another PLEX. Agent Liek knew that a proper civilization cannot be built in a single gaming session, even one packed with elite PvP. He visited Osmon again and again, planting the seeds of progress. The destruction of Hobbes Rotinque's Retriever was one more seed. Hobbes was disturbed by the experience. Change--real change--is never easy. For whatever reason, Hobbes was biased against the Code. Perhaps he instinctively felt the call to give up his life of bot-aspirancy, and it scared him. In almost every case where a miner embraces the Code, he is calm. And in every case where a miner compounds his Code violations with tearmaking, he is not calm. You can see why our Agents make calmness such a high priority. Hobbes sent mixed messages about his anatomy, but there was no mistaking his state of mind: He was a Goofus. Except in situations where our Agents show off their elite PvP prowess with simultaneous ganks, miners can only be ganked one at a time. By contrast, multiple miners can be cultivated at once. Our Agents don't need to fully rescue one miner before moving on to the next. After all, an unruly miner can be given follow-up visits later, if needed. Liek DarZ deleted Ivam Pirogof's Retriever from Osmon only to discover that a Goofus had been at the helm. The more time our Agent spent in Osmon, the more he found a need for a new equivalent to "miner calm down". There was definitely some perversion going on here. Could Agent Liek clear away the mess and make Osmon beautiful? Highsec is a wondrous place, especially now that the New Order is in charge. But it's not for everyone. 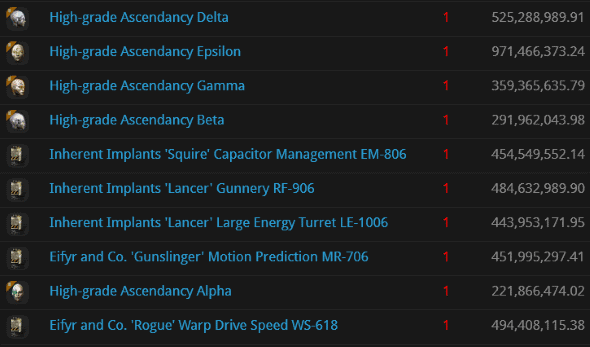 How can you tell if highsec is right for you? Well, if you don't belong in highsec, one of our Agents will show up and politely let you know. Here are some people who were gently nudged toward the exit during the week of November 20th @ 00:00 EVEtime through November 26th @ 23:59 EVEtime. Ah, just the kind of mining equipment every Retriever pilot needs. Yikes. Steven Schiavone2 apparently took the "gankers can't kill Skiffs" myth a bit too seriously. 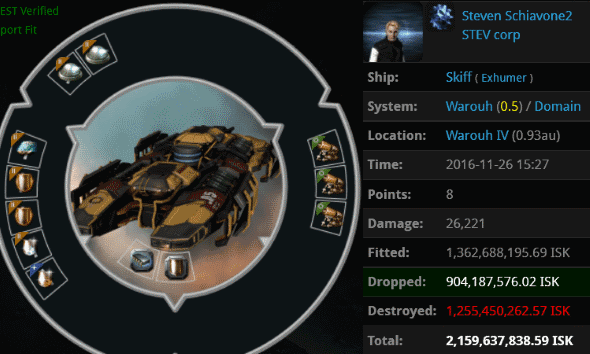 Steven's Skiff fit was so decadent that it guaranteed funding for anyone who would gank it. Agents Rick Therapist, Brutal Anna, Carebears' Nightmare, Profesor Woland, Marketka, and Marina Gankalot accepted the invitation and took him down. KAELSPACESHIPSONTHENET SPACEISBIG was AFK autopiloting in a shuttle. How quaint! New Caldari is Agent Ralliana's favorite 1.0 security system to kill things in, so she didn't hesitate to get involved. This must've been a delivery intended for a mining system. Somewhere there's a pair of Retrievers docked up and unsure of what to do with themselves. Ceswrath piloted a Mastadon, but on the inside there was a Mammoth pilot just waiting to break out. Though not as vulnerable as it would've been in a tech I hauler, Ceswrath's 5.8 billion isk cargo was not exactly safeguarded. Agents Tax Collector Emile, Australian Excellence, Tax Collector Richard, Taxman Daniel, and Tax Collector Zakard are exceedingly efficient at popping haulers of all kinds. Most of the loot value came from a bunch of new items related to something called an "engineering complex". I'm not sure I care to know what that is, but it doesn't really matter. 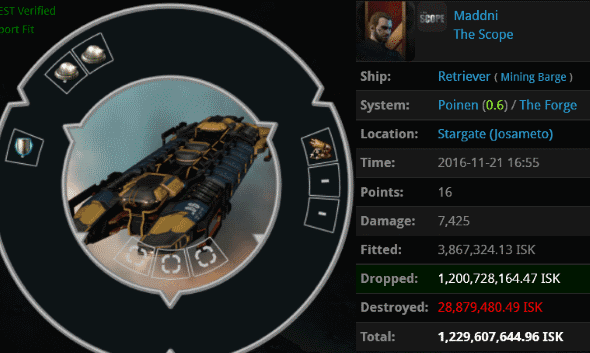 When CCP introduces new features, they merely provide more ways for carebears to lose expensive things. Lord Kador--"Overdrive Kador" as his friends call him--was in a big hurry. Not in-game, of course. That might've saved him. No, he was in a rush to do something while AFK. He could've put his freighter on autopilot, but even that would've been too safe. Instead, Overdrive Kador (we're all friends here) decided to chill out in an asteroid belt for a while. You can meet some interesting people in highsec asteroid belts, let me tell you. Agents Jack Fizzleblade, Hermann Fizzleblade, Nullus Modus, Archibald Fizzleblade, dAbOsSlAdY77, Franz Fizzleblade, Unfit ForDoody, Jet Set Milly, Lawrence Lawton, Ayatola Whoami, Austrene Jakuard, Yojiro, Emergent Gameplay, Collateralized Contracts, Janica Erris, Hagen Fizzleblade, Mack Poddington, Perlo Tissant, James Poddington, Dean Wong, Joe Kouvo, Hulk Poddington, Skiff Poddington, Mark Ormerant, Urban Worrier, and Ichami Akiga wanted to enjoy some time in an asteroid belt, so they decided to join Overdrive Kador. They discovered he was a Code violator, and death soon followed. Still losing Citadels? That's so last expansion of him. In nullsec, people like to make fun of FCON, but in highsec, we're willing to give everyone a chance. By violating the Code, Jonas McNeill wasted his chance to make a good impression. Agent Ralliana brought Jonas up to speed on how life in highsec works. To begin with, the absence of bubbles in highsec is no excuse for decadent implants. We follow the Code here. If you don't like it, go live somewhere else. If joy could be converted into pure sound, it would be the sound of an Agent announcing his arrival in a system of highsec. 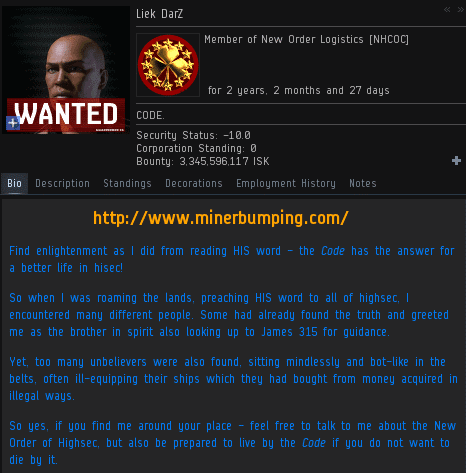 Agent Liek DarZ loves to educate and train highsec miners to obey the Code. He also loves killing the miners; his two loves fit together in perfect harmony. Liek DarZ's work in the Osmon system quickly bore fruit: Immediately upon announcing himself, he was paid 10 million isk for a permit by one of the local miners. Our Agent's heart was grieved when he discovered that very miner violating the Code only half an hour later. 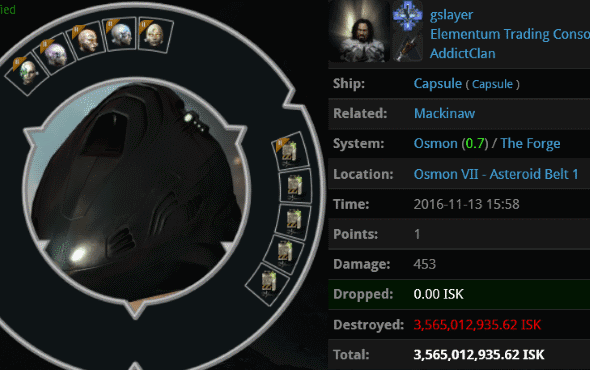 gslayer was caught AFK mining in a 566 million isk ORE-fit Mackinaw. 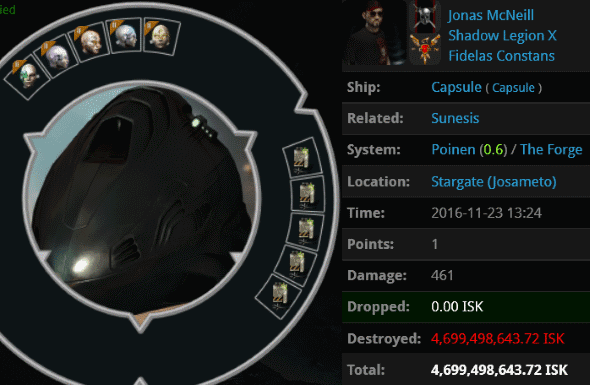 The miner had also been hiding a 3.5 billion isk pod, which earned a spot on the Kills of the Week. After destroying more than 4 billion isk of gslayer's assets, Liek DarZ hurriedly convo'ed the miner to see what had gone wrong. It's becoming more common these days for miners to excuse their AFK behavior with claims they'd been distracted by reading the Code. It's not a proper excuse. Reading the Code is important, yes. But even the rebels and Anti-Gankers read the Code. More important is living the Code. gslayer had tarnished his mining permit forever. Agent Liek offered him the opportunity to purchase a fresh one. Although our Agents are basically the only friends that the highsec miners have in this game, the New Order's role in the miners' lives goes well beyond friendship. We're basically their parents. Liek gave gslayer a fatherly talk, just like one from an episode of "Full House". gslayer was down in the dumps--further evidence that he placed too much emphasis on isk and material possessions in EVE. Agent Liek didn't want gslayer to spend his time wallowing in self-pity. It was time to help pull the miner out of the hole he'd dug for himself. It's extremely vital for miners to accept the blame when they get ganked. If the miner understands that he was at fault, then he knows that he can prevent further harm and improve his life by correcting his own actions. If a miner blames the ganker--whose actions he does not control--then he imagines himself in a terrifying and unpredictable world of chaos. That's no way to live. Our Agent wiped away gslayer's tears and got him ready for a new day. With that taken care of, Liek DarZ left the private convo and returned to Osmon local chat. Agent Liek modestly trumpeted his victory in local. But the news was met with some confusion. The Osmon miners gathered around. They were intensely curious about what had happened. Liek discovered that while the miners were all familiar with the New Order and its Code, they had misconceptions. There was a real danger that they could learn the wrong lesson from the gslayer gank. An Agent's work is never done.